After a fire, flooding is probably the most damaging and distressing event that can happen to a homeowner. Using the Environment Agency website you can check the risk of flooding for any postcode in the country. Enter your postcode you will see a flood map giving the predicted risk of flooding from rivers or the sea for that area. The map is a guide for a particular area and not specific for any individual property. If you discover your home is at risk of flood you should sign up to receive flood warnings from the Environment Agency either by telephone, text or email. Register here or by calling FloodLine on 0845 988 1188. Flooding can devastate a property so it is good to do all you can to prevent water damage, especially if you live in a high flood risk area or on a flood plain. The following tips should help you to prevent floodwater entering your home and to manage your home insurance claim. Check and clear the drains around your property regularly. This allows rainwater to run away freely. Fit temporary covers over any air bricks when flooding is expected. If the water level around your home is rising, raising the threshold of your doorway can be a remarkably effective way to keep low-level floodwater from entering your house. Sandbags are the most popular way to construct this kind of temporary flood barrier, but they can be hard to get hold of. If you live in an area that is at risk of flooding, keep some in a shed or garage so that you can access them easily. What can you do if you live in an area that is prone to flooding? If you live in an area that is at a high flood risk area you might decide to invest in more long-term prevention measures. Fitting flood guards to doors can be effective. Building permanent flood walls can be costly but may be a worthwhile undertaking if you live in an area prone to flooding. The average cost of flood protection for a typical semi-detached home is £2,500. However, it could even save you money in the long term by bringing down the cost of your home insurance. You could also discuss plans with a neighbour to see if they would like to share the cost and the benefits with you. You may find that protecting both properties is more effective and efficient than protecting one. Intelligent landscaping of your front and rear garden can help to divert floodwater away from your property. You can ask a horticultural specialist or landscape gardener for more information if you think that could be an effective prevention method for your home. You should also consider what steps you can take to reduce the damage if floodwater comes into your home. Obviously, you should move as much as you can upstairs. Begin with the more expensive items such as electrical goods and furniture. The answer to this question depends on the cover offered in your home insurance policy. Most home insurance companies will cover water damage to your property and possessions if your home is flooded. However some home insurers may only clean and repair possessions but will not replace them. Even if they are replaced, it may not be on a 'new-for-old' basis. Variations like these between home insurance policies mean that you should always check with your home insurance provider before commencing repair work or throwing away any water-damaged goods. Ask your home insurance provider if you should clean your property or if they will find a company to do it for you. Make your own records, marking the maximum height reached by floodwater in each of the rooms affected. It is best to use a permanent marker to ensure that these lines don’t disappear in the wet conditions. With the exception of perished food, don’t throw anything away until explicitly advised to by your home insurer or loss adjuster. 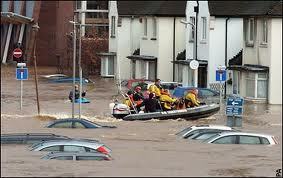 The National Flood Forum provides support and advice for the victims of flooding. Flooding can devastate your home and the necessary repairs often take many months to complete. Many home insurance providers cover the cost of belongings and repairs but do not include the additional expense of alternative accommodation.